Mrs. Dalloway, perhaps Virginia Woolf's greatest novel, follows English socialite Clarissa Dalloway as she prepares for a party in post-World War I London. Four-time Oscar nominee Annette Bening (American Beauty, The Kids Are All Right) performs Woolf's stream-of-consciousness style of storytelling brilliantly, exploring the hidden springs of thought and action in one day of a woman's life. When we first meet Clarissa Dalloway, she is preoccupied with the last-minute minutiae of party-planning while being flooded with memories of long ago. Clarissa then examines the realities of the present as the story travels forwards and back in time and in and out of different characters' minds. 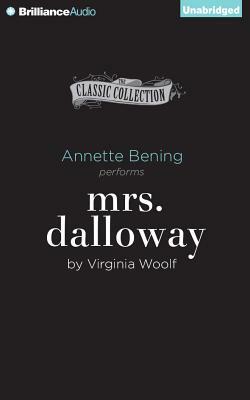 Mrs. Dalloway is daring not only in its stream-of-consciousness form, but also in its content. Woolf's depiction of Septimus Warren Smith brings to light the ugly and often ignored truth of how the brutality of war can drive men mad. We also get to see in depth how our main protagonist, Clarissa Dalloway, suffers from her own form of psychological damage: the more subtle, everyday oppression of English society. Mrs. Dalloway is part of Audible's A-List Collection, featuring the world's most celebrated actors narrating distinguished works of literature that each star helped select.